Intel teams with StarHub to offer the Intel Compute Stick as a freebie with the telco’s 1Gbps Fibre Home Broadband service, and other select broadband or HomeHub plans, for the coming PC Show 2015. From past offerings of gaming consoles, laptops, phones, the Intel Compute Stick is a first among telco broadband subscription freebies. The Compute Stick is a relatively geeky device – a low-cost, pocket-sized computer that can transform any HDMI display into a PC, capable of multimedia demands, simple games, and even full productivity suites. But a full fledged PC for entertainment? Only if you are a geek at heart and prepared to work around constraints such as the lack of USB ports, (there’s only one), and enjoy fiddling and troubleshooting new gadgets. How to Watch World Cup 2014 Streams – Free! World Cup 2014 is just around the corner, and it is fast reaching a fever pitch. The World Cup is the holy grail and we will soon get to see Cristiano Ronaldo and Lionel Messi vying for it, but if you are in Singapore – World Cup price from Singtel is $105 (excluding GST)* and it’s the same for Starhub. $105 or $112.35 after GST for 64 matches, which you probably can’t watch all of them either, is quite a sum to pay. So what are the options? Especially if you are in penny pinching mode. There will be free live screening at select community centres, thirty Community Centres (CCs) across Singapore will be participating in the live screening where members of the public can catach all the Group Stage action from the 2014 Fifa World Cup in Brazil. Great – if you live next to one, and with the matches all occurring around 4-7am, it isn’t very convenient. 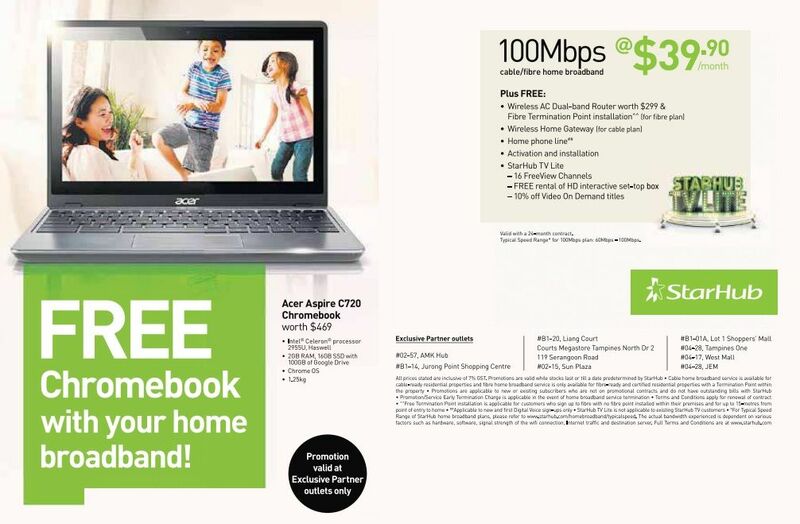 Starhub has restarted the Chromebook Acer C720 offer again for subscribers to the Cable/Fibre 100mbps plan at $39.90 in April 2014. The Acer C720 Chromebook is a 11.6 lightweight laptop suitable for on-the-go computing. The recommended retail price for the Acer C720 in Singapore is at $469. StarHub subscribers who sign up for the 100Mbps cable / fibre home broadband plan for two years at $39.90 a month will be able to get the C720 for free. The previous offer in December 2013 allowed users who sign up for the more affordable 25Mbps cable home broadband plan for two years at $24.90 a month were able to get the C720 with a $5 monthly top-up. Currently, whether this is available or not is still unknown. I might be tempted to go for the cheaper option personally as fibre configuration for my house would be just too messy. The C720 is a pretty good laptop. Online reviews have indicated that this is one of the better performing Chromebooks, thanks to the Intel Haswell processor + the SSD installed. Thank to the SSD, along with the lightweight Chrome OS lets the C720 boot in an estimated 8 seconds. So you get a similar Macbook air wannabe, with good battery performance, overall decent computing, at a fraction of the price, or for free thanks to Starhub. Despite the small space of 16GB, it is still more than sufficient for typical ChromeOS use. If you need more storage, you could pop in a SD card as well. Lastly, Google has also thrown in additional 100GB of cloud storage with Google Drive. This would be valid for two years. Acer had discontinued the 4GB ram model, but 2GB ram should still suffice for general web surfing. For more power users, thansk to the Intel chipset, the Acer C720 is also capable of booting up Linux, or an Ubuntu derivative, in the form of Chrubuntu. Here are the instructions on how to install Linux on the Acer C720. If you do not want the Chromebook, you can probably sell it for $250 on Hardwarezone. This brings down the effective price of the $39.90 contract to approximately $29.48, which is a great price to pay for a 100Mbps broadband contract. The price delta from the Singapore Acer C720 RRP is due to the fact that the model is only sold for US$199 in US. Once again, there is significant mark up for laptops in Singapore. It’s also actually pretty easy to buy the Chromebook from USA as well, as it can be shipped directly from US through Amazon. This however only applies to the Acer Chromebook C720 32gb SSD model, which retails at approx US$229. It’s one of the few laptops with Free Amazon Global Shipping to Singapore. While you are paying US$30 more for the 32gb model, it is still a great deal as more space never hurts. Seems like Amazon has also allowed free shipping to Singapore (fssg) for the Acer Chromebook C720 16gb model, which retails at $199. I think I might still pay $30 more for the additional storage since I intend to dual boot with Linux anyway, but both models are a great bargain!